We are a small, family owned and operated business specializing in high quality, hand made furniture and cabinetry for the entire home. Each piece is handcrafted to any design, style, or special specifications requested. We feature furniture designed in Shaker, Traditional Colonial, Early American, and our unique Early Settler's Rustic styling, but will also build to any custom design desired, using your own design, or utilizing our free, on site design service. All pieces are offered in over 25 different wood selections, from Northern White Pine to Heirloom Grade Bird's Eye Maple. We have specialized in Shaker Furniture and Shaker Custom Kitchen Cabinets since the early 1980s. In a deep appreciation for the clean lines and beautiful figured hardwoods the Shakers incorporated into their furniture, we have strived to create pieces as true as possible to the originals. From a classic Shaker Candle Stand, to a complete set of Shaker Kitchen Cabinets, the Shaker style has truly stood the test of time. o We now feature a new Custom Modern Furniture gallery with pieces in styles including Modern Arts & Crafts Furniture, Mission Furniture, Modern Asian Style Furniture, and Modern Japanese Style Furniture. o Examine the quality of our workmanship in these two Custom Home Libraries: Walnut Custom Home Library and Built-in Cherry Custom Home Library Bookcases. o We've updated our Kitchen Custom Islands and added a page showing Custom Island Features. o See our new Colonial Furniture II gallery. o We are starting to see requests for Asian Furniture. 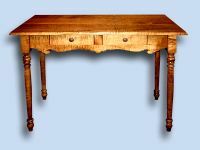 o We've added a 3rd Shaker Furniture gallery. 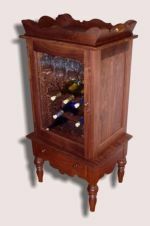 o Click on the Kitchen, Dining Room, Living Room, & Bedroom menus at the top of each page, to browse our handmade custom furniture by room. o View our new custom made Handcrafted Furniture gallery. o More additions to our Shaker Furniture, Colonial Furniture, & Early American Furniture. o See our new gallery of Kitchen Custom Islands. o Two new pieces added to our Showroom Specials. o New pieces added to our Reclaimed Furniture gallery. o Updates and additions to our line of Early Settlers Rustic Furniture. We custom stain to any color desired, and offer a wide selection of hardware, including some hand forged in our blacksmith shop. The leaded glass panels used in our various hutches, china cabinets and sideboards are also custom made to our customers requirements. Also of special note, is our relatively new line of Reclaimed Wood Furniture, utilizing recycled lumber to craft both rustic style and fine reclaimed furniture. Please browse our web pages and view a sample of our work. Should you have any questions, send them via e-mail, and we will answer as soon as possible. Our workmanship is unsurpassed, and our guarantee is lifetime. We invite you to visit our workshop and showrooms.